NEW YORK — Waymo, a division of Google’s parent company Alphabet that has been working on self-driving technology, will launch its ride-hailing network of self-driving cars in Phoenix sometime this year. It will then expand to other cities over the next two years, the company said Tuesday at an announcement event in New York City’s Chelsea Piers. Waymo will debut the I-PACE, a self-driving electric car designed with Jaguar, as part of this rollout this year. The company plans to add 20,000 of the cars to its fleet within the first two years of production. 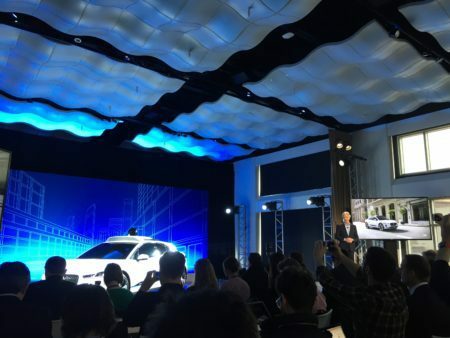 Waymo CEO John Krafcik announced the plans at a live press event and was joined on stage by Jaguar Land Rover CEO Ralf Speth. The ride-hailing network will first cover a 100-square-mile area in Phoenix, before expanding up to 600 square miles. Waymo has already been testing its ride-hailing service in the Phoenix metro area since late last year, through a program designed for residents (you need to apply online to become an “early rider”). When asked how many cities Waymo would extend its service to in the next two to three years, Krafcik said “more.” The company has not specified where it will be heading after Phoenix. The partnership with Jaguar will bring a car that Krafcik called “the self-driving car car-lovers have been looking for” to the roads. The ride-hailing network of Waymo’s autonomous vehicles will compete with Uber and Lyft, which are also working on developing their own self-driving technology. Uber was locked in a legal battle with Waymo for months over Uber stealing self-driving trade secrets from Waymo before settling for $245 million in February. As Waymo’s plans are ramping up, Uber’s have pressed pause. An Uber in autonomous driving mode with a human backup driver in the vehicle hit and killed a woman in Tempe, Arizona, last week, prompting Uber to halt its self-driving car testing. The incident is under investigation by the U.S. National Transportation Safety Board and Tempe police, and Arizona Governor Doug Ducey suspended Uber’s permission to test autonomous vehicles in the state at all. Real estate professionals nationwide have speculated what the proliferation of self-driving cars will mean for real estate: namely, that a home’s location could become less of a concern or selling point with easy transportation. When Waymo started piloting its ride-hailing feature in November before the upcoming launch of a full service, Phoenix real estate professionals told Inman that they welcomed the arrival of Google’s self-driving technology. In addition to developing a ride-hailing business, Waymo is applying its technology to trucking and logistics and working with cities on transportation issues.